In the 2000 comedy movie “Best in Show” the part of the Norwich Terrier, ‘Winky’ is played by Can Ch Urchin’s Bryllo. The Norwich Terrier has existed since at least the late 19th century as a working terrier in the East Anglia region of England and is named for Norfolk, England. It is believed to have developed from crossing various small breeds of terriers including the Irish Terrier and the small red terriers used by the Gypsies as ratters. They were first known as the Cantab Terrier after it became fashionable for students at Cambridge University in England to keep them in their rooms. They were also known as the Trumpington Terrier after the street where they were bred and developed at a livery stable. By the advent of World War I, they were called the Jones Terrier after the Irish equestrian Frank “Roughrider” Jones who was exporting large numbers of the terriers to the United States. At first, the Norwich Terrier was considered to one breed with two different ear types. Both the prick-eared and drop-eared dogs were interbred. However, this caused some problems with ear development and over time, only prick-eared dogs were bred to prick-eared dogs and similarly drop-eared to drop-eared. In 1964 The Kennel Club separated the two types into two distinct breeds: Norwich Terriers (prick ears) and Norfolk Terriers (drop ears). The dogs were used successfully as ratters in the stable yard, bolters of fox for the hunt, and family companions. The two terriers are the smallest of the working terriers. His double coat is hard and wiry and comes in all shades of red, wheaten, black and tan, or grizzle. It is generally short and smooth on the head and ears. Although he stands just 10 inches (25 cm) high at the shoulder, he is a powerful dog for his size and makes a good watchdog, always announcing the presence of strangers. Active and compact, Norwich Terriers have the feisty personality of all terriers. 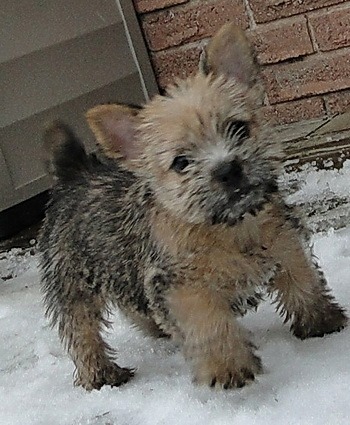 And like others in their group, they have the typical terrier fearless and independent personalities. 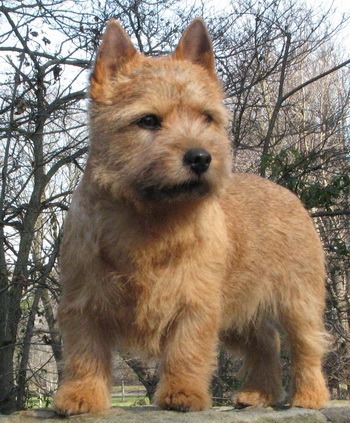 However, along with Norfolk Terriers and Border Terriers, Norwich Terriers are reputed to have the softest temperaments in the Terrier Group. They have lovable dispositions and get along well with other dogs. They are sensitive, love people, and are unhappy if kept away from human contact. Norwich Terriers should not be kept outside in a kennel. Outdoors, they are natural hunters with a strong prey drive for small vermin. Indoors this may be a problem if there are rodent type pets in the household. Curious, busy little dogs, they are tough physically, and long-lived (12-16 years). Norwich Terriers make excellent family pets and wonderful companions. However, due to their small litter size of 1 to 3 puppies, they are not a common sight. Norwich Terriers require regular exercise and grooming.